The NFT 1N/ 1N AF are indoor WI-FI access points based on 802.11N technology with integrated 2.4 GHz (2x2) MiMo radios boasting an output power of 28 dBm. 3 Ethernet ports allow connecting multiple devices to the access point. The NFT 1N model is powered with a 12-24V passive PoE adapter and the NFT 1N AF model supports the 802.3af standard, which allows powering the device using a PoE switch. 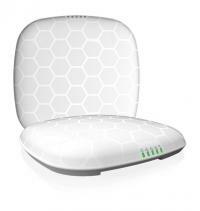 The indoor access point runs the Infinity OS - a highly functional and easy to use operating system. This powerful and flexible operating system ensures flawless operation of LigoWave hardware devices and effortless setup for those deploying the networks. WNMS is a FREE enterprise grade Wireless Network Management System. LigoWave’s comprehensive network management system supports several thousand of nodes. Multiple networks may be maintained and monitored using one server. A rich feature set helps to diagnose network problems effectively, visualize networks on a map, perform scheduled firmware upgrades automatically, track states of devices, get failure alerts, and collect statistics. WNMS is available as a stand-alone version for Linux and Windows servers, as a cloud-based system and as a mobile application for Android devices.